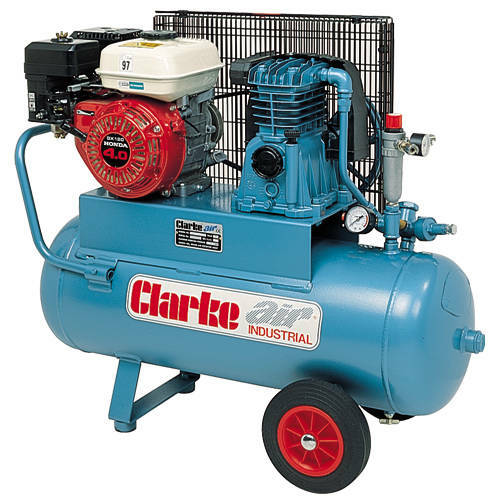 This is a portable belt driven air compressor is designed primarily for commercial & industrial consumers .With both the air pressure and capacity to drive most air tools, spray guns etc. this conveniently portable unit is ideal for mobile operators working remotely from mains electricity. An ideal choice for mobile mechanics, service engineers and farmers and DIY people. Specification also includes pressure gauge with twin air outlet taps & receiver drain tap. A Honda 4hp petrol engine, cast iron cylinder and professional quality components all combine to ensure reliable operation and a long service life. And the key components are safely protected against accidental damage by a sturdy steel wrap around frame.